David, now on the run, goes to Nob to the priest Ahimelech, asking for bread. He lies to obtain it since all the priests had was consecrated bread, which is bread reserved for the priests. But David is desperate. He is given the sword he killed Goliath with by the priest as well. One of Saul’s servants saw David at the priest’s place (which would later cost the priest his life). David, desperate, flees to Achish, king of Gaul, who has heard of David. David pretends to be insane in order to stay. Written when David was with Achish and pretending to be insane, David is praising God for delivering him from evil, saving him from troubles, blessing him, and keeping him from want. David advises us to do good, seek peace, and don’t tell lies. He hears our cries and delivers us. He slays the wicked. He protects us and heals us. 3) David is desperate, so he lies to the priest. God is always present, and Jesus as well. 4) The fact that they knew who he was. Word might get out to Saul where he was hiding. David pretended to be insane in order to stay. Psalm 56 tells us that the Philistines captured David and have no intentions of letting go the man who killed Goliath. 5a) David is grateful to God for taking care of him and providing all that he needs. He knows God will punish those who pursue him and do evil. b) Personal Question. My answer: David is very positive and confident in God as he is on the run. He knows God is taking care of him and in His time, all will be as it is supposed to be. This is encouraging to stay upbeat and know God is in control and to let Him be in control. Unimpressed with the questions. I just felt they were cursory to say the least. David flees to the right place — a priest. The priest, however, is confused on why such a prominent person would be alone. David lies about his situation, which he will regret later (1 Samuel 22:22). Many of us would have lied in the same circumstances; but that does not excuse it. The tabernacle of the Lord had a table that held twelve loaves of bread, symbolizing God’s continual fellowship with Israel. Literally, consecrated bread means showbread or “bread of faces.” It is bread associated with and to be eaten before the face of God. F.B. Meyer calls the showbread“presence-bread.” To eat the showbread was to eat God’s bread in God’s house as a friend and a guest of the Lord, enjoying His hospitality. In that culture eating together formed a bond of friendship that was permanent and sacred. The bread was always to be fresh. David receives the leftovers. One must be clean to eat the holy bread. It was to be eaten by the priests: And it shall be for Aaron and his sons, and they shall eat it in a holy place (Leviticus 24:9). Why did the priest give the bread to David? We cannot add to God’s word. God never said the bread was “only” for priests. Human traditions are never more important than God’s word itself, but we must never elevate our extension or application of God’s Word to the same level as God’s word itself. Doeg the Edomite: The word translated chief means mighty but can also be used to mean violent or obstinate. Doeg will show himself to be a violent and obstinate man. We shall meet him again. David continues in his lies to get his sword. It appears David is now trusting in weapons over faith in God, as shown by his continued lies. To us, God’s word should be our “give it to me” cry. 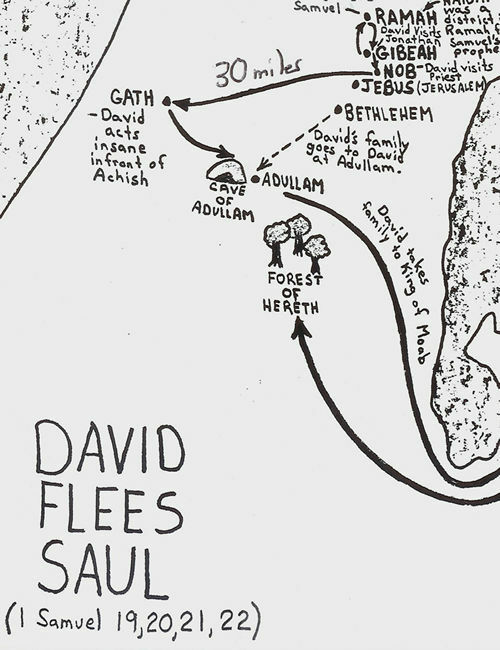 Why did David flee to Gath? David’s next move is confounding. David is now among the Philistines. He must be discouraged or deceived to think he could find peaceful refuge among these enemies of Israel. It didn’t make sense for the man who carried Goliath’s sword to go to Goliath’s hometown (1 Samuel 17:4). It didn’t make sense for the man who was sustained by the sacred bread of God to find refuge among the pagans. It didn’t make sense for the man after God’s own heart to lie. The Philistines of Gath recognized David as the king of the land of Israel. These ungodly men understood David’s destiny better than King Saul. Here, we see the price of fame (1 Samuel 18:6-7). David is captured by the Philistines as Psalm 56 tells us.David thought he could find anonymity or sympathy among the ungodly Philistines in Gath and disappear, but he was wrong. Psalm 56 describes David’s journey from fear to praising as a prisoner in Gath. Psalm 56 shows that David turned back to the Lord here. Hence, the slide that had started since he left Jonathan to now stops. Saul never turned back on his path. Why did David act like a madman? Basically, David humiliated himself before the Philistines. The saliva on the beard was a sign of madness because men in that culture would consider this something only a man out of his right mind would allow. David’s plan worked. Achish decided that this wasn’t David after all, or if it was he was such a pathetic specimen that he may as well let him go. Was David walking in the Spirit or in the flesh when he pretended madness? Some commentators believe that David was in the flesh and trusting in himself. But the change of Psalm 56 happened before David’s escape, and it made sense that the Lord would guide David into a path of escape that would humble him. When David tried to protect himself with lies and tried to find refuge among the ungodly, he really was acting crazy. Trusting in God was the only sane thing to do. Psalm 34 is David’s declaration of joy when he escaped from Gath with his life. The title of Psalm 34 reads, A Psalm of David when he pretended madness before Abimelech, who drove him away, and he departed. Abimelech was probably a title given to rulers among the Philistines; the ruler’s proper name was Achish (1 Samuel 21:20). A fugitive from Saul, David went to the Philistine city of Gath but found no refuge there and narrowly escaped (1 Samuel 21:10-22:1). Following that, David went to Adullam Cave where many desperate men joined him. This joyful and wise Psalm seems to have been written from that cave, and sung in the presence of those men. The structure of this Psalm is acrostic, or nearly so. Each verse begins with another letter of the Hebrew alphabet, except for the letter waw. The purpose in this Psalm mainly seems to be as a device used to encourage learning and memorization. Psalm 34 begins beautifully (Psalm 34:1-4) as David is full of gratitude to God who got him out of a mess he himself created. God’s amazing goodness is shown when He delivers us when we don’t really deserve it. David was hiding in his heart from God. Paul, in his great passage on boasting, may have remembered this saying and this episode, and so recalled his own ignominious escape from another foreign king (2 Corinthians 11:30-33. Glorify is magnify in Hebrew. David knew there was something magnetic about the true praise of God. When one genuinely praises God, he or she wants to draw others into the practice of praise. Magnify means to make Him larger in one’s perception. Magnification does not actually make an object bigger, and we can’t make God bigger. But to magnify something or someone is to perceive it as bigger, and we must do that regarding God. Commentators are divided as to if David sinned when he feigned madness among the Philistines or if he was obedient and guided by God. The idea is that they draw something from God’s own glory and radiance. Later, the Apostle Paul would explain much the same thought: But we all, with unveiled face, beholding as in a mirror the glory of the Lord, are being transformed into the same image from glory to glory, just as by the Spirit of the Lord. (2 Corinthians 3:18) This radiance is some evidence that one has truly looked to Him. 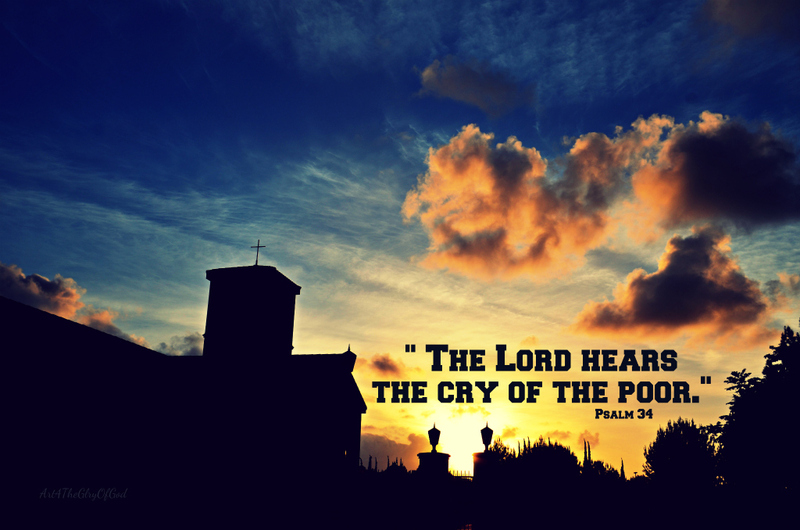 What is a cry to the Lord? A cry is short and not sweet. A cry is brief and bitter. A cry is the language of pain. A cry is a natural sound. A cry has much meaning and no music. David is at a low point. A rag-tag group of desperate losers gathered to him at Adullam. David was still filled with praise and trust, even knowing that God had an angelic camp of protection all around him. Many times in the Old Testament, the angel of the LORD is an actual material appearance of Yahweh Himself (as in Judges 13 and some other places). We don’t know if David meant that is an angelic being sent by God, or God Himself present with the believer. Both are true. David challenged the reader (or singer) of this Psalm to experience God’s goodness for himself or herself. It could only come through a personal encounter, in some ways similar to a taste or to see. Taste and sight are physical senses, ways in which we interact with the material world. In some ways, faith is how we interact with the spiritual world. In this sense to taste and to see are trusting God, loving Him, seeking Him, looking unto Him. David thought to fear the LORD was much like trusting Him and experiencing His goodness. This fear is the proper reverence and respect that man has for Deity. 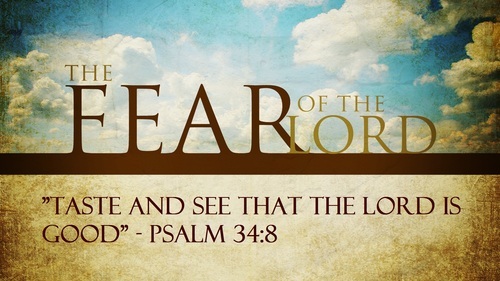 If you really experience God’s goodness, if you really experience the blessedness of trusting Him, you will also have an appropriate fear of the Lord. Many who were in distress, in debt, or in discontent gathered at Adullam cave (1 Samuel 22:1-2) with David. Here, David teaches them and offers advice. According to the Gospel of John, David spoke not only of his own experience, but also prophetically of the Messiah to come, Jesus Christ. John explained that the Roman soldiers that supervised the crucifixion of Jesus came to His body on the cross, expecting to hasten and guarantee His death in the traditional way – breaking the legs of the crucified victim. When they looked carefully, they learned that Jesus was already dead, and they pierced His side to confirm it. John wrote, these things were done that the Scripture should be fulfilled, “Not one of His bones shall be broken” (John 19:36). The evil-doers own evil destroy himself or the evil-doer will be in misery. Many centuries later the Apostle Paul would write, There is therefore now no condemnation to those who are in Christ Jesus (Romans 8:1). Even under the Old Covenant, David knew something of this freedom from condemnation.